Objective: This study investigated whether the canal curvature has an influence on the accuracy of Electronic Apex Locator. Materials and Methods: Sixty mandibular posterior teeth were decoronated. A number (No.) 10 file was inserted into the mesiobuccal canal and radiographs were taken to determine the degree of curvature by Schneider's method. Samples were divided into three groups of mild (<20 o ), moderate (20-36°) and severe curvature (>36 o ). After enlarging the orifice, the actual canal length was determined by introducing a file until the tip emerged through the major foramen when observed under 20X magnification. The teeth were embedded in an alginate model and the Root ZX was used to determine the electronic length. The data was analyzed by Kruskal-Wallis test followed by Mann-Whitney test. Results: The difference in measurement of Actual and Electronic working length was statistically significant between group 1 and 2 (P < 0.05) as well as between group 1 and group 3 (P < 0.05) with group 1 showing the lowest difference. Conclusion: Considering ± 0.5 mm as tolerance limit for accuracy, the device was 95% accurate for the mild curvature group and 80% accurate for moderate and severe groups. Failure to accurately determine and maintain WL may result in length being too long leading to apical perforation, overfilling or overextension and increased post-operative pain with prolonged healing period and a lower success rate. A WL too short of the apical constriction can lead to incomplete cleaning and under filling causing persistent discomfort, and continued periradicular infection. Curvature of the root canals is commonly encountered in clinical situations which could be another morphological influencing factor related to working length determination. A scanning electron microscope (SEM) study evaluating Root ZX EAL for its accuracy found that the error in locating the apex was significantly smaller in cases with a normal apical foramen than in cases with a lateral foramen  where in a sharp curvature of canal exists at the apical third. One study compared Raypex 5 apex locator and conventional radiography for determining WL of straight and curved canals. Result of this study showed that the percentage of electronic measurements within ± 0.05 of AWL was 70% for straight canals and 35% for curved root canals. These findings might be leading towards the assumption that curvature may be a significant factor contributing to the inaccuracy of EAL. No studies till date have been published assessing whether root canal curvature has any effect on the precision of Root ZX apex locators. The purpose of this study was to evaluate whether the canal curvature had any effect on the accuracy of EALs. The hypothesis of this study was that the curvature of root canals has a role to play in determining the accuracy of electronic apex locators. Sixty human extracted mandibular molars with various degree of root curvature were collected. Teeth were stored in a thymol solution until use. Gross debris was removed from the root surfaces with a 10 minute soak in 6% sodium hypochlorite (NaOCl). The root surface and apical portion of each tooth were examined for the absence of fractures and resorption and the presence of a mature apex under a dental operating microscope (Pico, Carl Zeiss, Jena, Germany) at 20X magnification. The crown of each tooth was sectioned at the cemento-enamel junction with a diamond disk to gain unrestricted access to the canal system and to obtain a constant reference point for all measurements. A number (No.) 8 or No.10 K-file was inserted into the root canals until the tip of the instrument was just visible at the apical foramen to verify patency of the canal space and the apical foramen. The coronal third was preflared using the Sx files of ProTaper rotary (Denstply Maillefer) instruments. Each canal was irrigated with 2 mL of 3% NaOCl solution. Patency was constantly checked. The actual root canal length was determined by introducing a No. 8 or No. 10 file into the canal until the tip of the file emerged through the major apical foramen when observed under a microscope (Carl Zeiss) with 20× magnification. The stopper was adjusted to correspond to the flat reference surface. A digital caliper was used to measure the length between the stopper and the tip of the file to the nearest of 0.01 mm. This was taken as the Actual Working Length (AWL). A perforated plastic cylinder was filled with freshly mixed alginate for embedding the roots in it. Cold cure acrylic resin was used to firmly hold the root in place. The cylinder was placed in a plastic box filled with saline soaked sponge. The canals were irrigated and excess fluid was removed. The lip clip was firmly secured to the plastic box, with part of it dipped in saline. The file clip was attached to the file and the file inserted until the "Apex" reading was reached in Root ZX (J Morita Corp, Tokyo, Japan). This was taken as the Electronic Working Length (EWL). Differences between EWL and AWL were calculated. Positive values indicated measurements that were long of the apical foramen, negative values indicated measurements that were short of the apical foramen and 0.0 values were considered coinciding measurements. The collected data was analyzed by Kruskal-Wallis test followed by Mann-Whitney test. [Table 1] shows the number of canals in various groups for varying differences between actual working length and electronic working length. The difference in mean values of AWL and EWL was not statistically significant in any of the groups (P > 0.05) using t-test. The difference between AWL and EWL (absolute difference) was found to be slightly higher in Group 3 followed by Group 2 & Group 1 respectively [Table 2]. The difference between the groups with respect to mean value were found to be statistically significant (P < 0.05). Further, it was observed that the difference was statistically significant between Group 1 and Group 3 (P < 0.05) as well as between Group 1 and Group 2 (P < 0.05). No significant difference was observed between Group 2 and Group 3 (P > 0.05). The development of EAL has helped in making the assessment of working length more accurate and predictable. The electronic root canal length measurement devices work on the basis of impedance and capacitance of the root canal system. Root ZX calculates the ratio of impedance values at 2 frequencies (8 kHz and 0.04 kHz). It has a built in processor that relates the value of the ratio with the position of the file. In the current study only one calibrated operator carried out the electronic readings, to obtain precise and consistent results. The extent to which the in vitro studies depict the clinical accuracy of EALs is not known. However, they are able to reproduce the clinical condition of EAL use and allow the objective assessment of several variables which is not feasible in in vivo studies. , Hence this in vitro study was done, with some known influencing factors like irrigants, and coronal preflaring of canals, kept constant. Digora imaging software was used to calculate the angulation of the teeth in mesiodistal and bucco-lingual direction. Any specimens with marked curvature in the mesio-distal direction were eliminated as it may influence the study outcome. A study done by Pangica AM et al.,  on methods for evaluation of root canal curvatures suggested that Schneider's method is reliable to determine the degree of root canal curvature. Huang et al.,  suggested that EALs operate on the principle of electricity rather than the biological properties of the tissues involved. The materials most often used for immersion of extracted teeth are alginate, , agar, , saline solution  and gelatin. The alginate model, is sufficiently strong to hold the roots, and allows the roots to be hidden, making it possible for measurements to be made objectively with minimum bias. Also, it is easy to prepare and is inexpensive. Difference between the EWL and AWL was calculated. The decision to analyze these data using the absolute value of the difference in canal length determination, was to eliminate any bias since both under and over estimates of AWL would contribute to the overall error rather than cancel each other out, which would lead to larger deviation from AWL. In the present study, the difference (absolute difference) between EWL and AWL was found to be slightly lower in Group 1 followed by Group 2 and Group 3, with statistically significant difference between Group 1 and 2 (P < 0.05) and between Group 1 and Group 3 (P < 0.05). Thus, the hypothesis of the study was accepted when the tolerance was taken as ± 0.5 mm. Considering ± 0.5 mm as tolerance limit for accuracy, the device was 95% accurate for the mild curvature group and 80% accurate for moderate and severe groups. Also, 95% samples showed a negative value indicating EWL being short of the apical foramen in moderate and severe curvature group whereas 65% samples in the mild curvature group showed a negative value. The frictional resistance on the file in the more curved canals, the less taper and smaller size of the canals could have contributed to such differences. The device gave 100% accuracy in detecting the apical foramen for a tolerance limit of ± 1.0 mm for all groups. Thus, EALs are accurate devices (tolerance limit ± 0.5) for determining working length in curved canals, and can be used as useful adjuncts to radiographs. The radiographs still would remain as the primary method for length detection because of their added advantage in determining the anatomy of the root canal system, the number and curvature of roots, the presence or absence of disease, and to act as an initial guide for working length. Curvature of the canal has a small but significant contribution on the accuracy of the EAL tested. Considering ± 0.5 mm as tolerance limit for accuracy, the EAL was 95% accurate for the mild curvature of canal and 80% accurate for moderate and severe canal curvatures. The EAL gave 100% accuracy in detecting the apical foramen for a tolerance limit of ± 1.0 mm for all range of curvatures. Thus, within the limitations of the present study, Root ZX can be called as a reliable adjunct to radiography for determining working length of root canals. American Association of Endodontists Glossary of Endodontic Terms. 7 th ed. Chicago: AAE; 2003. Seltzer S, Soltanoff W, Smith J. Biologic aspects of endodontics. Part V. Peripical tissue reactions to root canal instrumentation beyond the apex and root canal fillings short of and beyond the apex. Oral Surg 1973;36:725. Cox VS, Brown CE Jr, Bricker SL, Newton CW. Radiographic interpretation of endodontic file length. Oral Surg Oral Med Oral Pathol 1991;72:340-4. Pagavino G, Pace R, Bacetti T. A SEM study of in vivo accuracy of the Root ZX electronic apex locator. J Endod 1998;24:438-41. Ibarrola JL, Chapman BL, Howard JH, Knowles KI, Ludlow MO. Effect of preflaring on Root ZX apex locators. J Endod 1999;25:625-6. Venturi M, Breschi L. A comparison between two electronic apex locators: An in vivo investigation. Int Endod J 2005;38:36-45. Ebrahim AK, Wadachi R, Suda H. Ex vivo evaluation of the ability of four different electronic apex locators to determine the working length in teeth with various foramen diameters. Aust Dent J 2006;51:258-62. Mull JP, Manjunath V, Manjunath M. Comparison of accuracy of two electronic apex locators in the presence of various irrigants: An in vitro study. J Conserv Dent 2012;15:178-82. Sadeghi S, Abolghasemi M. A comparison between the Raypex5 apex locator and conventional radiography for determining working length of straight and curved canals. Iran Endod J 2007;2:101-4. 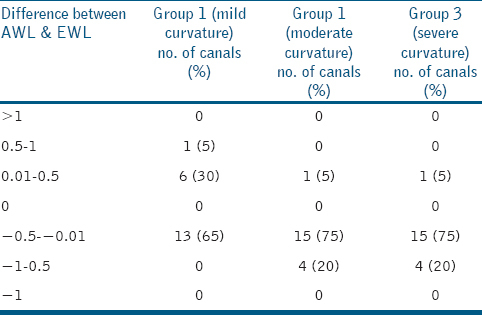 Schneider SW. A comparison of canal preparations in straight and curved root canals. Oral Surg Oral Med Oral Pathol 1971;32:271-5. Kuttler Y. Microscopic investigation of root apexes. J Am Dent Assoc 1955;50:544-52. Dummer PM, McGinn JH, Ree DG. The position and topography of the apical constriction and apical foramen. Int Endod J 1984;17:192-8. Green D. A stereomicroscopic study of the root apices of 400 maxillary and mandibular anterior teeth. Oral Surg Oral Med Oral Pathol 1956;9:1224-32. Fouad AF, Reid LC. Effect of using electronic apex locator on selected endodontic treatment parameters. J Endod 2000;26:364-7. Nekoofar MH, Ghandi MM, Hayes SJ, Dummer PM. The fundamental operating principles of electronic root canal length measurements devices. Int Endod J 2006;39:595-609. Plotino G, Grande NM, Brigante L, Lesti B, Somma F. Ex vivo accuracy of three electronic apex locators: Root ZX, Elements Diagnostic Unit and Apex Locator and ProPex. Int Endod J 2006;39:408-14. De Moor RJ, Hommez GM, Martens LC, De Boever JG. Accuracy of four electronic apex locators: An in vitro evaluation. Endod Dent Traumatol 1999;15:77-82. Puri N, Chadha R, Kumar P, Puri K. An in vitro comparison of root canal length determination by DentaPort ZX and iPex apex locator. J Conserv Dent 2013;16:555-8. Ebrahim AK, Wadachi R, Suda H. In vitro evaluation of the accuracy of five different electronic apex locators for determining the working length of endodontically retreated teeth. Aust Endod J 2007;33:7-12. Wu YN, Shi JN, Huang LZ, Xu YY. Variables affecting electronic root canal measurement. Int Endod J 1992;25:88-92. Pangica AM, Biclesanu C, Florescu A. Methods for evaluation of root canal curvatures. IFMBE Proc 2013;38:159-62. Huang L. An experimental study of the principle of electronic root canal measurement. J Endod 1987;13:60-4. Lucena-Martín C, Robles-Gijón V, Ferrer-Luque CM, de Mondelo JM. In vitro evaluation of the accuracy of three electronic apex locators. J Endod 2004;30:231-3. ElAyouti A, Weiger R, Lost C. The ability of Root ZX apex locator to reduce the frequency of overestimated radiographic working length. J Endod 2002;28:116-9. Stoll R, Urban-Klein B, Roggendorf MJ, Jablonski-Momeni A, Strauch K, Frankenberger R. Effectiveness of four electronic apex locators to determine distance from the apical foramen. Int Endod J 2010;43:808-17.